PTC Windchill 10.2 provides SolidWorks, NX, CATIA V5, AutoCAD, and Autodesk Inventor users with the ability to launch the New CAD Document command directly from their CAD application. In PTC Windchill 10.2, users of SolidWorks, NX, CATIA V5, AutoCAD, and Autodesk Inventor can launch the New CAD Document command directly from their CAD application. Previously, this command was only available from the Workspace toolbar from within the PTC Windchill Workgroup Manager embedded browser. 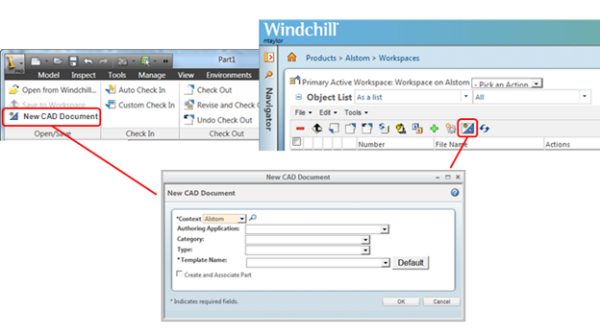 The New CAD Document action is available from the CAD authoring application as well as from PTC Windchill. The CAD user does not have to leave the CAD environment and go to the PTC Windchill Workgroup Manager to create a new CAD document. For more information, see the New CAD Document topic in the PTC Windchill Help Center. Tip: Enter the topic name in the PTC Windchill Help Center search field to easily navigate to the topic.